Pretty much everything about the 2015 World Cup Championship Women's National Soccer Team is inspiring, including midfielder Megan Rapinoe. And as if you needed any more reason to love her, Megan Rapinoe spoke to ESPNW about being an openly gay athlete in an inspiring interview. And as usual, she is excellent. 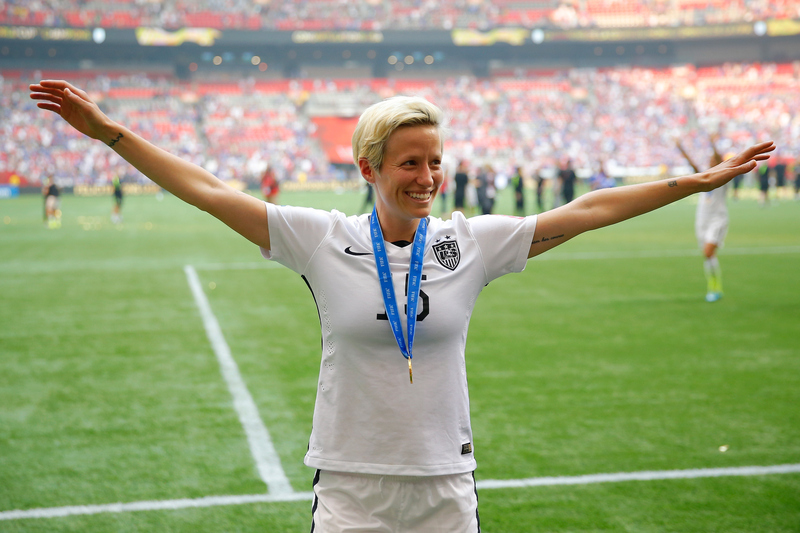 Rapinoe, age 30, came out to the world as a lesbian in 2012 in an interview with Out magazine and has been an advocate for LGBT equality ever since. She's done work with the Gay, Lesbian, & Straight Education Network and the group Athlete Ally. She's also very openly proud of her identity — recently when asked to sum herself up in one word, she gleefully responded "GAAAAY!" Homophobia still exists in the sports world, just as it does everywhere (though the world of women's sports has traditionally been more supportive of openly gay or bisexual athletes than men's sports has been). So it's always amazing to see LGBT athletes come out and spread positive messages, especially to young LGBT people. Which is just one reason that stars like Rapinoe are awesome. In her latest interview Rapinoe discusses everything from her experiences coming out to her advice for LGBT athletes to her personal life. Here are a few of the best quotes. It's been a journey and a process of becoming totally out and sort of living that truth and having it be a daily thing. I'm at the point now that I want people to know that, and I want to talk about it. We're coming so far as a society, but we still have so far to go. So until we're all the way there, I'll probably die talking about it. [Robbie Rodgers] is the only [active] openly gay athlete across all the major professional [team] sports in the U.S. It's incredibly sad and mind-blowing at the same time. There are plenty of sports teams that say they're very open and super accepting in the locker room. But are they really? Is it really a safe environment? Have they preset that environment to make these players feel comfortable for coming out? I don't think so because there's none out. Sera turned 40 this year, so I'm like, "I've got to do something seriously awesome." And she followed me around all summer. I had planned this trip to Orcas Island [near Seattle] and got a cute little cabin. I'm really bad at planning-and Sera knows that. So in her mind, she was trying to figure out all the details. She was like, "OK, I know we're going to go somewhere cute and romantic because it's my birthday." And so she had this whole engagement plan. She had gotten the ring. We had a great dinner. We were in this beautiful cabin. And she just totally surprised me, got down on one knee, and cute nothings, cute nothings, and asked me to marry her. It was really sweet, very, very us. I would tell them to come out and that it's going to be OK.
You can watch a video with clips from the interview and read the full transcript on ESPNW here.